Decorative Life: Many weeks to months and even years depending on growing conditions. Member of the Rutaceae (rue family). Common relatives lemon, orange, grapefruit and kumquat. Leaves are elliptic, 2-4 inches long, with winged petioles. Branches spineless or with short prickles. Classed as a dicotyledon, leaves not parallel veined. Fragrant flowers. Fruit is very acid with some culinary uses similar to lemons and limes. Can be considered as a flowering plant but more generally treated as a foliage plant. Chill sensitive, store above 55F, up to 65F. 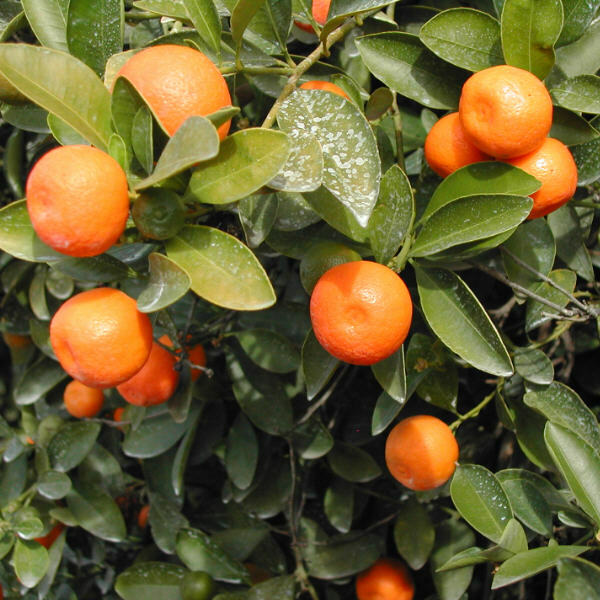 The X before the species name indicates that this plant is an interspecific cross, and in this case, between Citrus and Fortunella (kumquat). The names C. mitis and C. madurensis have been misapplied to this species. The specific epithet name of “mitis” means mild or gentle whereas “microcarpa” means small-fruited. Flowers intermittently year-round. Has nice green, glossy foliage. Direct or filtered sunlight is preferred. Likes acid soils or growing media. The not so recent but important research findings of Ben-Jaacov et al. (1984) showed that this species could be stored at 54F in the dark for two weeks with no loss in quality upon removal or during subsequent interior use. Additionally, the plants could be packed and stored in a horizontal position to increase packing density by 50% with no loss in quality compared to plants packed in the normal vertical position.